The warm weather in Western Massachusetts teases us to use our outdoor grill. Winter brought snow, freezing temperatures and ice, but now we are enjoying the milder conditions outside! Tulips, daffodils and forcythias are all blooming at once. The outdoor grill rather than the oven inside will be used while preparing dinner. PARMESAN TOAST is a great addition for dinner. The oven is not used for this delicious replacement for rolls. Quick, easy and appetizing! This also tastes great with Lasagna or Manicotti. It is time to make more Yogurt! One container of plain yogurt remains in our fridge and it will be used for the next batch of yogurt that will be prepared later this morning. This healthy, creamy and easily prepared food is delicious! 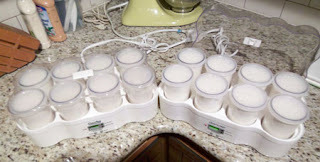 About twenty-six years ago I used a Salton Yogurt maker. That has been replaced by two Donvier 8 container yogurt makers. Flavorings? My family uses the Freezer Jam that I prepare every summer. Homemade yogurt with a small amount of freezer jam or fresh fruit is yummy! It is time to use the outdoor grill in Western Massachusetts! Our outdoor thermometer reads 85° F. Snow shovels, snow blowers and boots have been replaced by short sleeves and shorts. Tempting Tenderloin will be served for dinner tonight. This Pork Tenderloin is easy to prepare and tastes delicious! Serve with a garden salad and a microwaved “baked potato”. Yummy! Receiving a box of homemade cookies in the mail is such a great treat! For a special day or if a member of your family is in college, this unexpected gift is ALWAYS WELCOME just before FINALS! Last week a box of Craisin Raisin Oaties was mailed to our son in NYC. Supplies: Cookies, (2) gallon size Ziploc Bags, & 1 container of Paper Muffin Liners. Open Ziploc bags. Place 1 Ziploc Bag inside the other and place flat on a table. Then put each cookie on a Paper Muffin Liner. Stack 4 cookies high & place in the bag. Usually, 12 – 16 cookies will fit in the Ziploc Bag. Now, carefully remove any excess air in the inner bag and then zip. Then zip the outer bag. Place these treats inside a crumpled newspaper lined addressed box. Tape the box and it will be ready to go. After mailing the box of treats will be on their way to a very happy recepient. We all take short cuts. 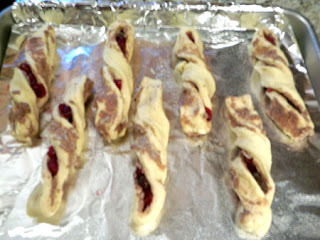 Plumped Raisins & Craisins can be added to Pillsbury Cinnamon Twists before they are baked. 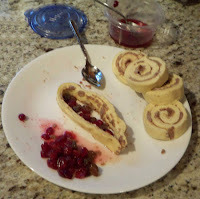 These refrigerated sweet rolls are found in the Dairy section of your supermarket. Prepare and bake following the directions on the package with one addition. Place the opened unrolled dough on a plate. Fold in half. In the middle, add about 8 Plumped Raisins &/OR Craisins and then twist the dough and pinch the end before placing on the baking sheet. Bake 15 – 16 minutes or until golden brown. After cooling, spread glaze. ***An extra bonus – After glazing, they can be stored in the freezer. Place in a single layer in a Gallon size Ziploc Bag. For that reason I usually prepare and bake two batches. On the morning that you plan on preparing Scrambled Eggs for breakfast keep in mind that 2 Egg Whites equals 1 Whole Egg. For each serving of Scrambled Eggs use 1 whole egg and two egg whites. Place in a bowl with about 1 TBS. Milk (can be Soy Milk). Mix and pour into the skillet. Add one slice of Kraft sliced American Cheese that has been broken into pieces and scramble all. The cheese will melt while cooking. Delicious Scrambled Eggs await! And … they contain a lower cholesterol level plus calcium! In today’s busy world it is useful to have baking ingredients “ready to use”. 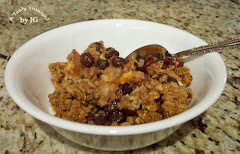 I use Raisins & Craisins quite often in foods to give a particular food an extra special taste. In my refrigerator there usually is a 1 Cup Ziploc Container of Apple Juiced Raisins & another 1 Cup container filled with Apple Juiced Craisins. To prepare: Place Raisins in the container and then add the Apple Juice. Place the lid on container and refrigerate. Do likewise with the Craisins. For best results wait 2 days before using. They come in very handy!